It’s been far too long! I confess I have been distracted by many things in the past month. I know life updates are not my usual blog post topic, but last weekend Ric and I graduated from seminary, Ric recently got a new job, and we will be moving to the ‘burbs in a few short weeks! Lots going on around here. In the midst of all this, my poor blog has been forsaken. I do apologize. I ate meat for the first time in four years. Bacon … the gateway drug meat. Let me explain. The main reason I am a vegetarian is because I do not want to support the majority of the meat industry, whose business practices are shady, and who treat farmers horribly, and sell questionable meat packed with antibiotics, growth hormones, steroids, and who knows what else. (Google probably knows.) Animals are raised in CAFOs (Concentrated Animal Feeding Operation); they are packed in with hundreds or even hundreds of thousands (in the case of chickens, for instance) of other animals, with no room to move around. This negatively impacts the environment, pollutes waterways (potentially harming people), and harms the animals themselves. They get sick easily, which necessitates the antibiotics, and are basically standing in their own filth. Disgusting. For more information about the whole dang meat industry, I suggest watching the documentary Food, Inc. OK, done ranting. For the past few years, my church has had a partnership with a local farm. We personally know the farmer, and we often buy eggs from her. She comes to our church a couple times a month and sells meat and eggs. We know that she has a small family farm and they are dedicated to raising hogs in their natural environment. They do not use growth hormones, antibiotics, or steroids. And it makes a difference. They produce quality meat that tastes great. If you’re in Chicago, you can find C&D Farms at farmers markets and other locations, listed on their website. We had bought some bacon from Crystal, the farmer, for a big family brunch. I figured I knew exactly where it came from and that I could trust its quality, so I ate it. And it was delicious. All of this to say, I still consider myself a vegetarian, but you may find me eating some meat from a local farm once in a blue moon. OK… confessions of a bacon-eating vegetarian out of the way. Time for pizza. If you know me, you probably know how much I love pizza. I think I could eat pizza every day. I might if it was in any way healthy. I’ve got two pizzas for you. The first, Ric made, and the second was my creation. I wasn’t very specific with amounts for ingredients, because you can decide for yourself how much you want on your pizza. That’s the great thing about pizza — you can throw whatever you want on some dough and call it good! 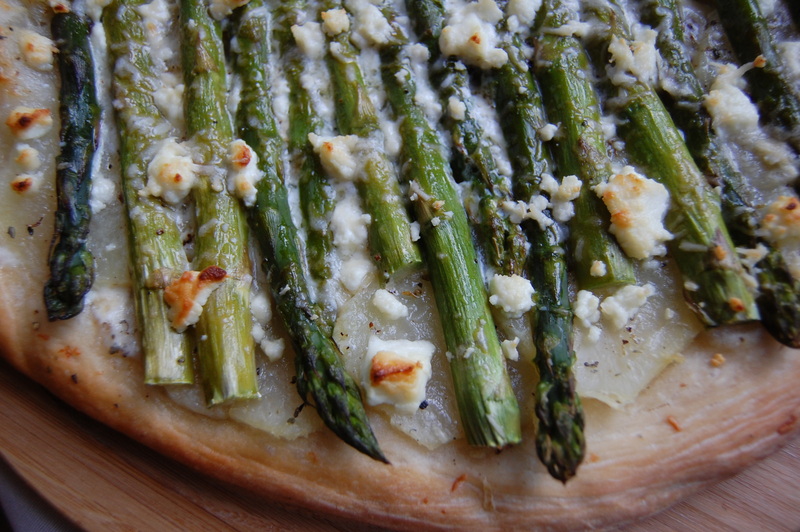 Before making the pizza, you’ll need to blanch your asparagus. Blanch is just a fancy word for giving your asparagus a quick bath in boiling water. Blanching helps preserve the yummy flavor, crisp texture, and bright green color. First, prepare a bowl with ice and cold water and set aside. Next, Bring a pot of water to a boil on medium-high heat, drop your asparagus in, and cook for 2-5 minutes (until it turns bright green). Remove the asparagus with tongs or a slotted spoon and put them in the bowl of ice water. This will stop them from cooking any further. Now, get your dough and stretch it out. We get our dough from Trader Joe’s (of course). And even though I know wheat is healthier, we usually get the white dough because it’s easier to work with and tastes better. 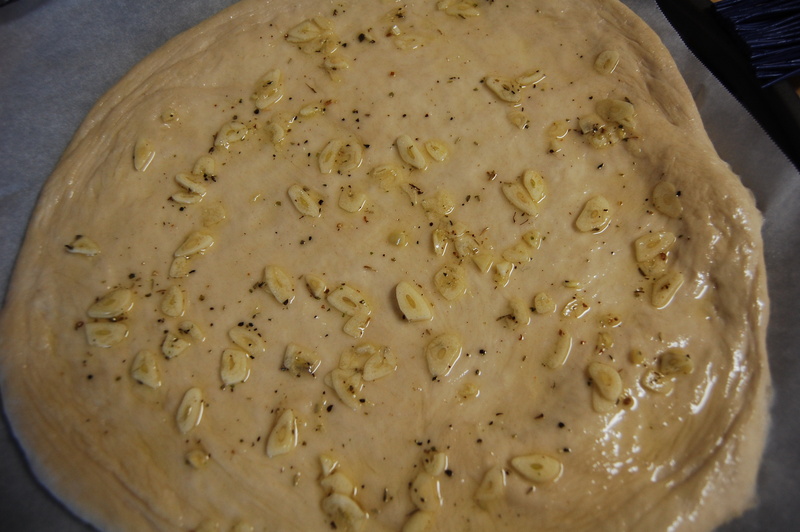 Drizzle your dough with olive oil. Spread with minced garlic if you’re into that. 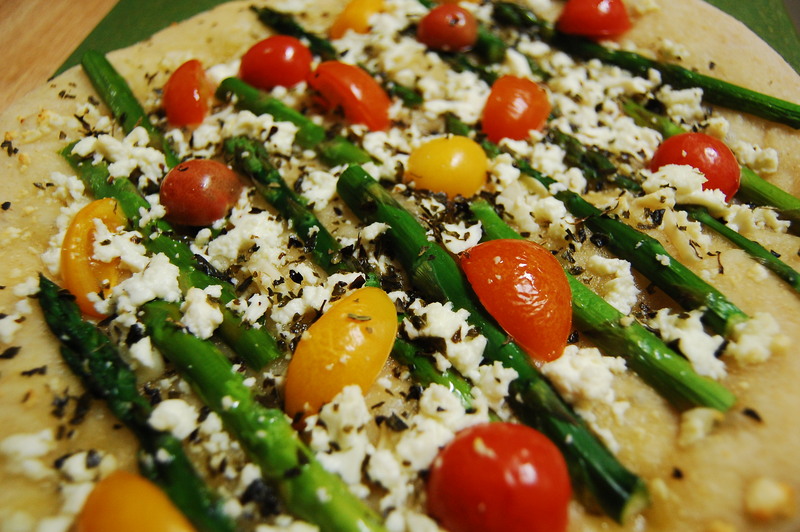 Top with asparagus (you can cut them up if you want; we just left them whole), crumbled goat cheese, tomatoes and herbs. Consult the dough packaging for cooking instructions. Boil your potato until soft, and cut into thin slices. Blanch your asparagus using the directions above. Stretch out your dough. Drizzle with 1 tbsp. olive oil and cover in garlic slices. Season liberally with fresh cracked pepper, and just a little bit of salt. Cover the dough with potato slices and drizzle those with the remaining oil and the cream. I consulted another recipe for the amount of cream and it suggested 1/2 cup, but I used just under that amount. I suggest starting with 1/4 cup and adding more as needed. Once you’re done with the cream, season the potatoes with herbes de provence. 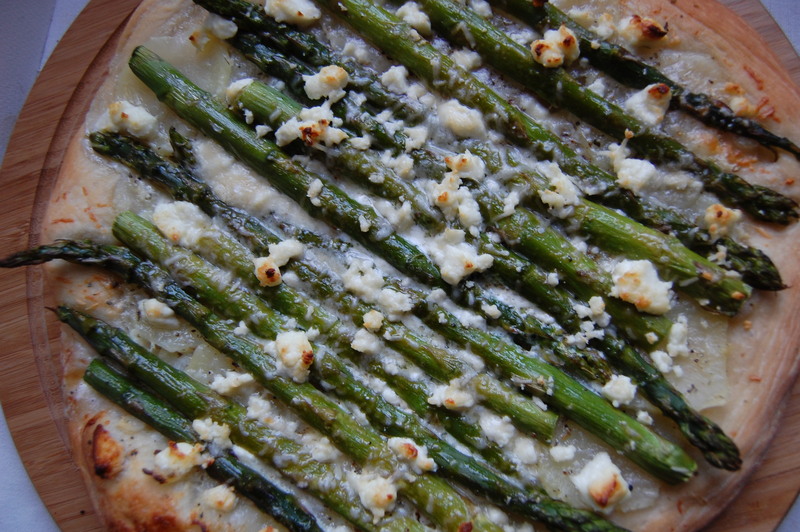 Lay the asparagus over potatoes, and sprinkle goat cheese and parmesan cheese over everything. Use as much or as little as you like. Bake at 425° for 35-40 minutes, until cream is bubbling and dough is golden brown around the edges.